Can you believe we’re just over half way into the year?! It’s seems like just yesterday we were adjusting to those New Year’s resolutions, doesn’t it? I’m happy to say that we’re still going strong on our family commitment to eating better so we can all feel and look better. I’ve found that if you simply make it a lifestyle change, rather than a “diet”, then that’s when you’re truly on the road to success. Finding healthier alternatives to your favorite foods are really the key to staying on track. By switching out certain ingredients and making small tweaks to even your favorite comfort food recipes, you can still enjoy all the flavor and tastes you crave. One of my newest swap finds is Brummel & Brown. 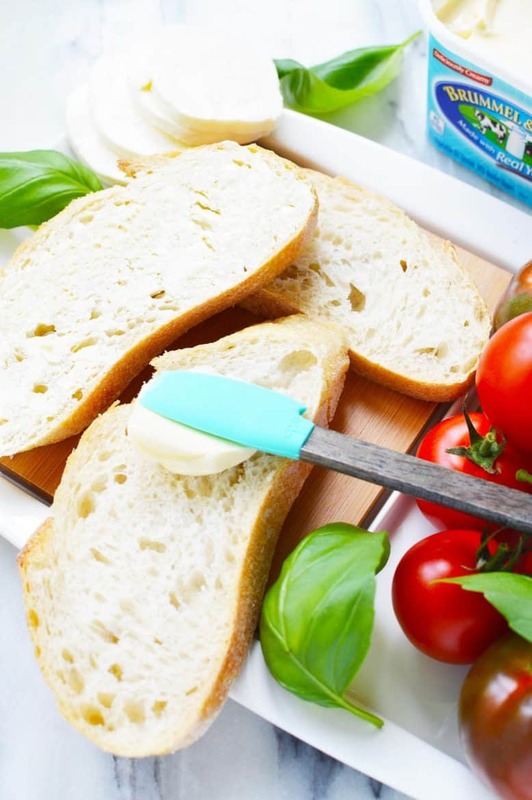 Made with plant-based oils, purified water, and the goodness of real yogurt, it has a wonderfully creamy flavor with less fat and calories than butter. 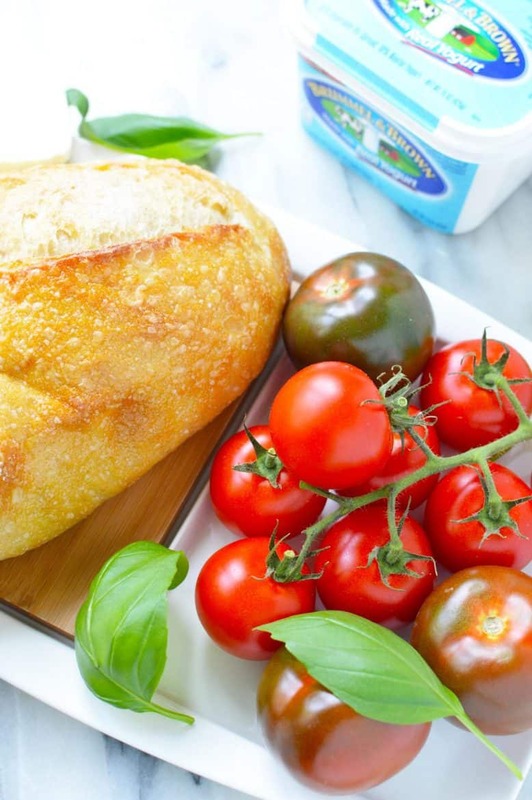 I was going through my photos from Italy the other day and started craving two of my favorite Italian meals, fresh made Bruschetta and a Caprese Salad. 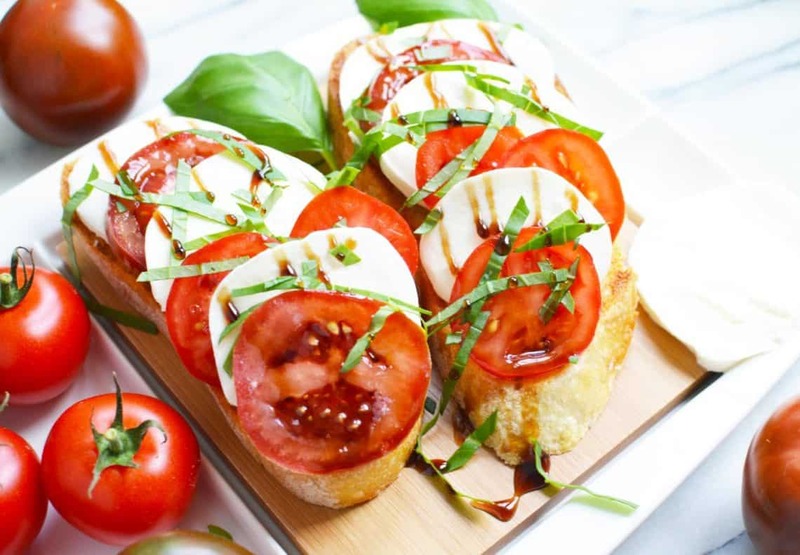 I decided to make a mash of the two and holy goodness, this Caprese Toast Recipe might be my new favorite lunch ever. 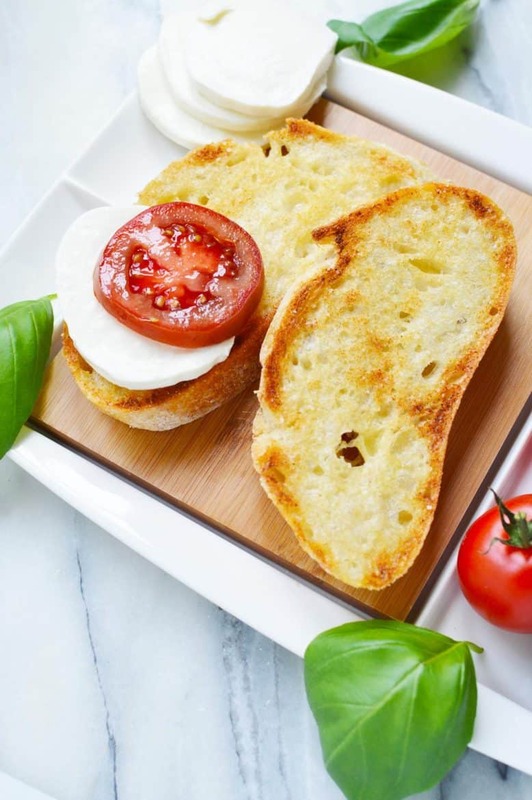 Slice a few thick pieces of your favorite crusty bread and spread a generous amount of Brummel & Brown on top of each piece, being sure to cover the tops. Broil until golden brown. While toast is browning, prepare balsamic glaze. Stir together vinegar and brown sugar in a small saucepan. (If you want to make this even healthier, substitute the brown sugar for xylitol!) Bring to a boil over high heat while stirring often. Reduce to medium heat and allow to boil for about 6 to 8 minutes, or until reduced by half. 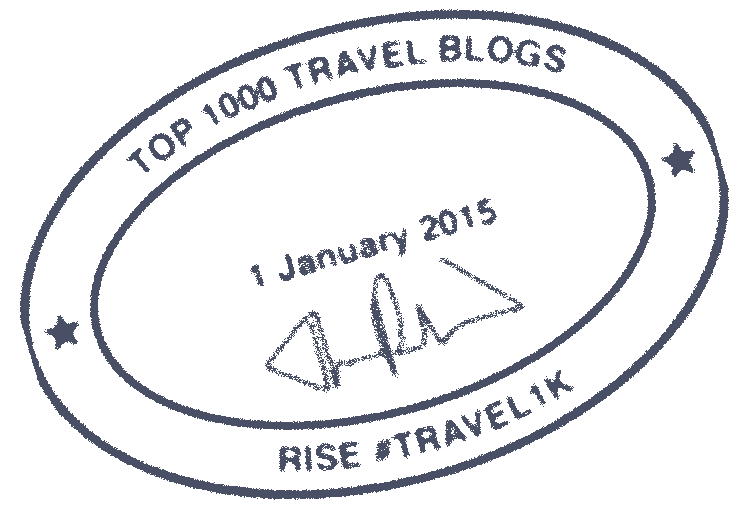 You can go longer or shorter depending on desired thickness. Stir occasionally. Set aside. When toast is ready, rub each side thoroughly with halved garlic slices. Top with alternating layers of the fresh mozzarella and tomatoes. 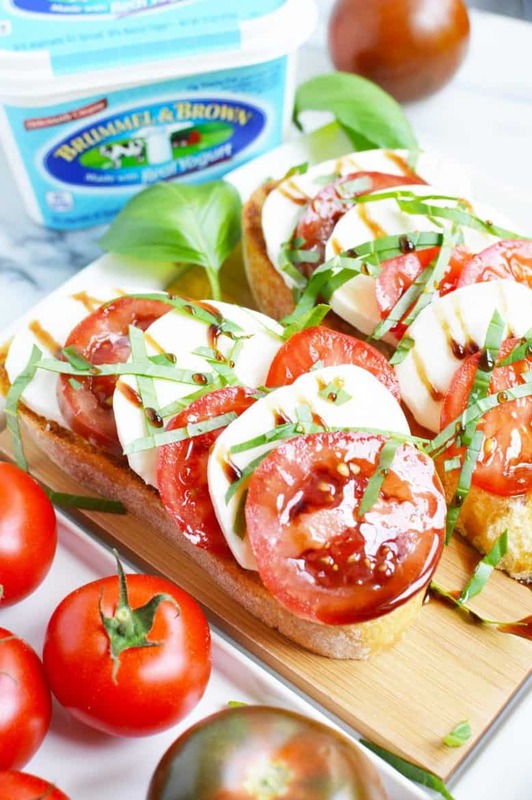 Sprinkle some of the fresh basil on top and drizzle the balsamic glaze over everything. We enjoyed this right away but it would also make for a tasty picnic sandwich or dinner party appetizer. My son requests this almost daily, so it appears to be a favorite no matter what your age! You can find Brummel & Brown by the butter spreads at Albertsons. 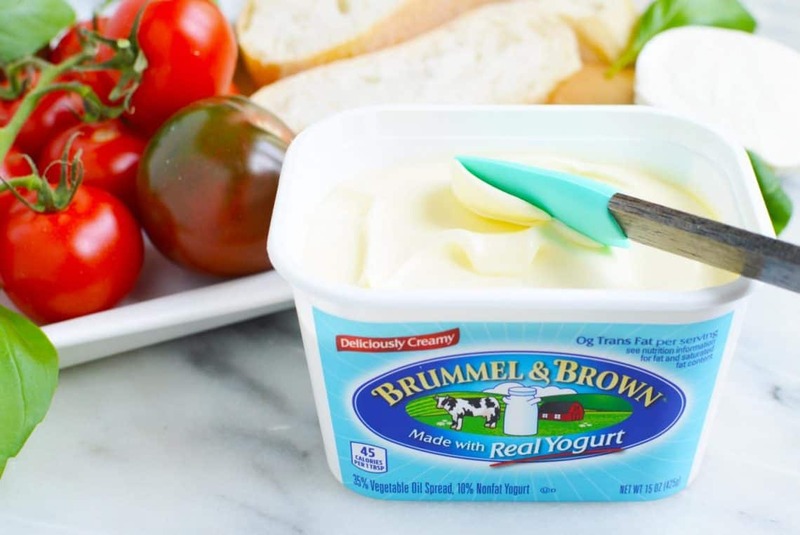 Use this Just 4 U Digital Coupon to SAVE $1.00 on any ONE (1) Brummel & Brown® spread product – Valid 7/1/18 – 7/31/18!